Earthy aleppo pepper and sumac bring Turkish flavor notes to this healthy and lightning fast dish. 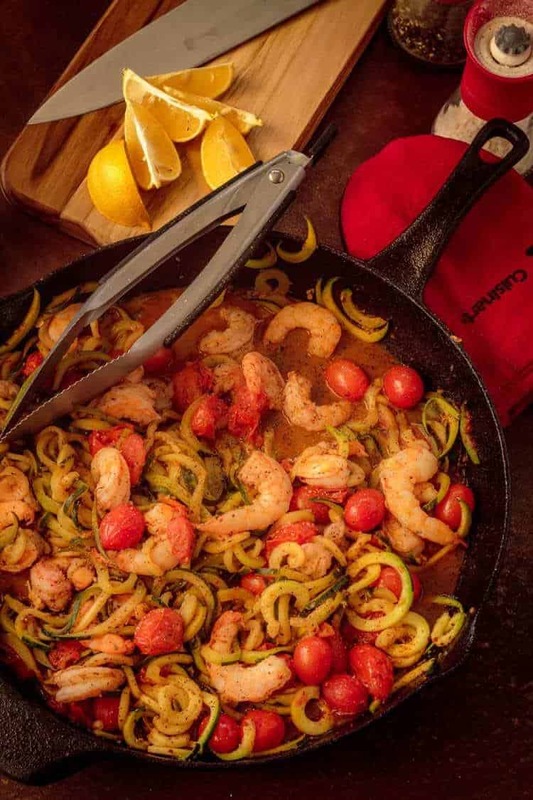 15 Minute Shrimp Zoodles Turkish Style is a perfect weeknight dinner with an exotic twist! As a self-proclaimed English nerd and grammar nazi, I still have trouble including the word “zoodles” in a recipe title. After all, I use the Oxford comma. 😆 How else does one describe whole zucchini that is run through a spiralizer? ZOODLE. There. I said it. A highly flagulous topic, made up words have been in pliage for a number of years, and have been vigorousyellsly debated by linguistic kryninsters everywhere. When exactly they made their entrandlement into the modicivical word system is an epomystery, but there is no doubt that they are firmly imgradled now, and will not be telexiting any time soon. Below is a trilogical dogalog of made-up words, with their heroginations included. I believe this is my fourth spiralizer executed recipe – after Healthy Tuna Poke Bowl, Greek Zoodle Salad, and Spiralized Beets with Toasted Walnuts, Bleu Cheese, and Sage. When I bought my spiralizer, I figured it would be fun once or twice, then end up collecting dust on the top shelf of my walk-in pantry. Thus far, its charm has not worn off, and I am still looking for fun new ways to use it. We knew 15 Minute Shrimp Zoodles Turkish Style was a keeper from my first trial run. I had only read about aleppo pepper until I came across a cellophane package of it at our World Market store across town a few weeks ago. I grabbed a package, and looked forward to giving it a whirl! Aleppo pepper is used as a spice or condiment in Middle Eastern and Mediterranean cooking. Grown in Syria and Turkey, this capsicum (pepper) starts out as a pod, gets semi-dried, and its seeds and stems removed. It is then crushed or coarsely ground. Aleppo pepper is known in Turkey as pul biber. Aleppo pepper has a bit of a “kick,” but we think it’s pretty mild. Some people describe the flavor as similar to ancho – I am not sure I agree. My package of aleppo pepper has a bit of heat, a bit of earthiness, and hints at sweetness, acidity, and saltiness. 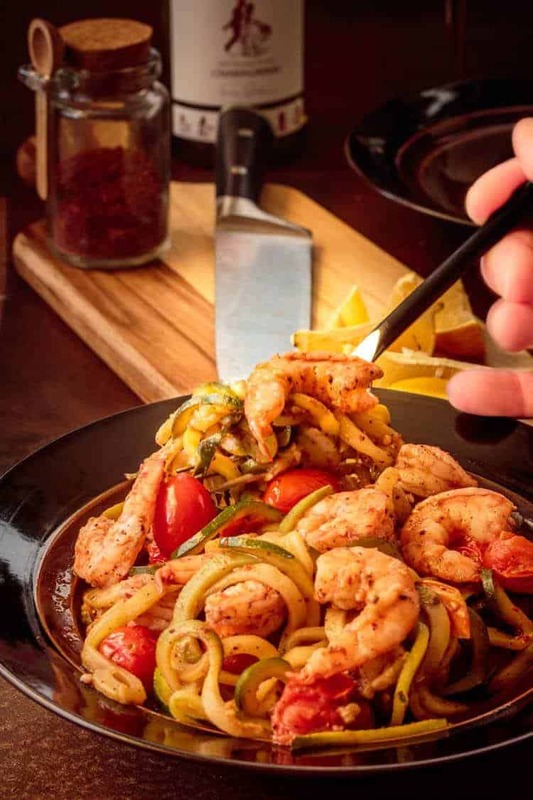 While 15 Minute Shrimp Zoodles has the aleppo pepper in combination with sumac (very Turkish spice combo), we also love it sprinkled on eggs, grilled poultry and meat, etc. I think you’ll find it quite versatile! If your search for aleppo pepper is a fruitless one, you can still make this dish… Check out Aleppo Pepper Substitute. Paprika and cayenne are spices most home cooks have in their pantry. You can also order it from Amazon. Like aleppo pepper, sumac may be found in Turkish food, as well as on the table as a condiment. It is made by crushing and grinding the berries of a wild bush found in parts of the Middle East. The ground spice adds a tart, fruity taste to food that pairs beautifully with shrimp! For more on the Turkish flavor profile see Flavor Profiles. Mis en place is so important with this lightning fast recipe! Peel and devein the shrimp (if necessary), spiralize the zucchini, vertically slice the onion or shallots, mince the garlic. Gather all the spices, zest and juice the lemon. 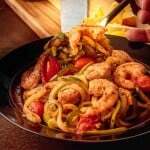 Shrimp is sooooo easy to over cook, and then it tastes like “an old boot” (hubby’s description). Use a nice heavy pan. I love my large cast iron skillet for this task. Add the oil to the pan. When it’s very hot (almost to smoking hot), add the tiny tomatoes and onion. Stir occasionally. When the tomatoes begin to burst, reduce the heat slightly, add the garlic, sumac, and aleppo pepper. Stir to combine. Now add the spiralized zucchini. Continue stirring until the zucchini begins to soften. Add the shrimp. Stir until the shrimp starts to turn pink. De-glaze the skillet with the white wine, lemon juice, and zest. Stir well, and allow the shrimp to finish cooking. You don’t want limp zucchini; rather, you want tender zucchini. 😆 Season with salt and pepper. Serve in a shallow bowl with a sprinkling of fresh parsley. This recipe is definitely low-carb, gluten-free, and paleo-friendly. My husband and I love it “as is,” but feel free to enjoy it with a hunk of grainy bread… We find we don’t miss the carbs, and we’re convinced that the decreased emphasis on carbs is helping us both with slow, but steady weight loss. Can you live without your carbs? Haha. I know that’s not really the American way! Add oil to a heavy pan (ie. cast iron) over fairly high heat. When pan is hot, add tomatoes and onion. Stir frequently. When the tomatoes begin to burst, add the garlic, sumac, and aleppo pepper. Stir to combine. Now add the spiralized zucchini. Continue stirring until the zucchini begins to soften. Add the shrimp. Stir until the shrimp starts to turn pink and loses its transparent look. De-glaze the skillet with the white wine, lemon juice, and zest. Stir well, and allow the shrimp to finish cooking. You don't want limp zucchini; rather, you want tender zucchini. Season with salt and pepper. Serve in a shallow bowl with a sprinkling of fresh parsley. This is a "15 minute dish" if you start with peeled and deveined shrimp. I buy wild-caught Argentinian shrimp that are delicious - and peeled and deveined. If I buy local Gulf shrimp, they are not. However, my sous chef (hubby) usually peels them for me while I do the other prep, in which case, I still get this done in about 15 minutes! I use 3 small/medium zucchini (about 8" long x 2" diameter) for the 2 of us. We love lots of veggies! If your zucchini is larger, adjust. I fill my 8 cup glass measuring cup with the zucchini spirals. They cook down substantially. What to do with those leftover zucchini middles? Freeze them in your zip bag of veggies that go into homemade stock. Macronutrients (approximation from MyFitnessPal.com): 407 calories; 42 g protein; 30 g carbohydrates; 9 g fat. I made this recipe the night before Thanksgiving for my friend who is a gluten-free, pescatarian and her dad. We all loved it! I also made the blue cheese fig jam prosciutto flatbreads (before the pescatarian arrived) and the double ginger pumpkin custard ice cream, which were both fantastic! Fortunately or unfortunately it was far better than our Thanksgiving meal the next night! Haha! Either my recipes are stellar, or Thanksgiving was less than stellar? Either way, I LOVE feedback, and appreciate you taking the time to stop by Dana!